Are you enthusiastic about learning languages? ... especially German? 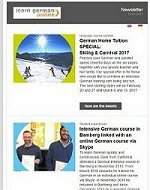 Keep up-to-date with the newsletter of Learn-German-Online.net and inform yourself here. Simply fill in your Name, Email address and Country, then click "submit" and in the next step you can choose your newsletter version(s). Salutation* Please select Mr. Mrs. Mx. I have read the Data Privacy Statement and agree on the transfer of my personal data. For final confirmation of your subscription, you will get an e-mail immediately. It is absolutely free and you can cancel your subscription at any time. Why join our "Learn German Online News" e-mail list? * We refer here only to our newsletter editions of the current year. However, it exists since 2004. If you need information from previous newsletters as shown here, please write us. We appreciate your comments and your suggestions about newsletter topics.